Can you say "delighted"? Every month end as I anticipate the reveal on the next CKCB kit to copy, I always wonder (and ask if I have the chance) if there will be green in it. Hurrah! This month the kit features REAL GREEN! I was looking at the kit, on screen, then looked out the window and realized the colour was spring grass green. The view of the barn, and the green grass poking up in places over the dead, yellow grass certainly got me in the mood to capture some stories about this wonderful old farm. And this is the kit to do it with. The kit to copy is from Jenny Bowlin. No wait, it is from Counterfiet Kit Club, as we are copying the first kit CKC revealed back in 2011. Check out the original post details here. And the challenge to copy ourselves is here. I had so many great papers to choose from for the theme, and I usually use neutral card stock these days so in place of coloured card stock, I chose patterned paper. Reminisce, Farm Life, The Barn. <take special note of this one. It sets the mood for the month. Pink Paislee, Pretty Lace <exact match to original kit. Fun Fact: this paper is printed with soy inks. Red and Cream lace, I am pretty sure this is a Jenny Bowlin paper. Then I added the "stuff"
accidentally missing from this photo is CTMH waxy flax in yellow, and two antique stick pins. The waxy flax got it's self stuck to something else and I didn't notice it missing from the final picture until posting. Black doilies are white with the addition of ink. PP in place of cardstock again. Green hex, and boarders are sides A and B of Echo park, For the record by Bella Road. Embossed Cream, Core dinations with Jenny Bowlin. Red Soda Label, Jenni Bowlin Studio. 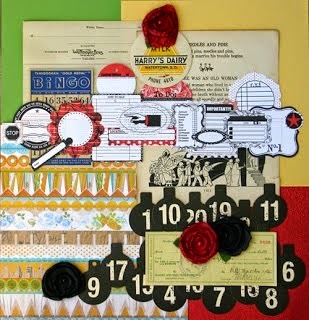 Stuff: Big red buttons, Gramma's button box. Felt flowers, Basic Grey, Oliver, Bloomers. Paper tape : 7 gypsies, postale. 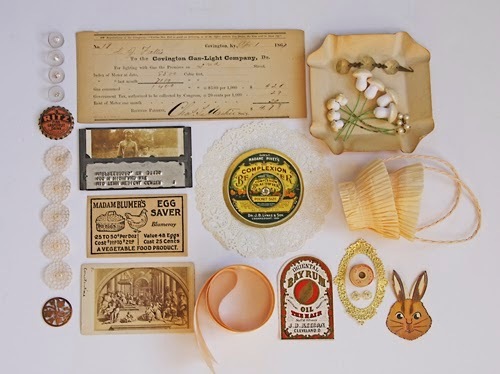 Vintage bits, bottom right, Graphic 45, Commuique Collection, Typography. Brown paper bag from gift shop with vintage ads on it. 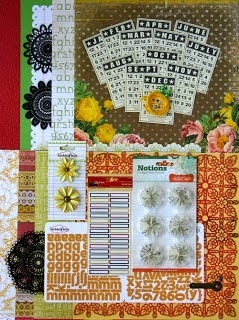 Random die cuts and journaling spots from stash. Crowning vintage find: A world war II Canadian Rations book. Found in a boutique scrapbook store in Edmonton. What made them extra cool is that they were from Boyle, which is a town in the county, in which I live. Also the surnames on them were familiar to me. Ok they are not just cool or extra cool, they are SUPER cool! This kit reminds me of Rose Mille Studio's cachette collections. Beautiful to inspect on line but not in my budget. I struggled somewhat to put mine together. Sometime you have to give up on on piece by piece comparisons and just try for the "feel" of the kit. I like the monochromatic trend that is surfacing. Hard to follow it to the letter when you LOVE colour. The large frame is an unused marriage certificate. I fussy cut out the middle part which had one signature on it. Perhaps someone changed their mind? Gold dresden frame will be constructed out of fussy cut bits from a gold paper doley. Washi tape in place of satin ribbon. Spool labels were from a freebie print out for a kit a couple of years back. These, I gotta use or loose. The stamps are genuine. From France, no less. I ordered a t-shirt for the grand kids from Poisson Rouge. If you have preschoolers in your life. You will want to check out "Red Fish Soup"
Sheep die cut, in place of the rabbit. Vintage paper doily. Very intricate, and of higher quality than the ones currently available. Journal spot on top left, 29th Street Market, Spirit Sisters, Foliage. Fancy Pants, Its' the little things. Dream Street, Tea for Two. Thickers, Hello, Burlap letter stickers. They smell so good. Like potato sacks under the August sun. A wonderful kit. Love how you took the inspiration from right outside your window - a perfect spring collection to match what you see. There's a lot to love in all your three kits and I really think you have summed up all that fresh, yet vintage, feeling. You will have such a great base to work on with all those farm layouts. Not your usual style I think but very much something I can see you working on and turning into your own. love it and have been loving your more regular updates! Such a lovely and full kit! I can definitely see how you were inspired by the barn and the re-greening right out your window. I also like the vintage look and feel of the add-on, which will definitely go well with your kit. Hope you enjoy using it this month! BAM! You knocked this one out of the park! Your inspiration photo is tailor made for the kit and your translation through your products is spot on. I did see you added green, but am a bit surprised you didn't add more! LOL! I think you added just right amount. Fabulous kit and so glad to see you playing along. Hugs! I love your kits, you really captured the feel of the originals! Fantastic kit. Your barn is very inspirational. Kit looks fab. Love that picture. You know I am loving this with all the vintage! That marriage certificate is beautiful (I would have cut the middle out, too) & the ration book is such a FAB find for you. You've done a really outstanding forgery this month, with lots of clever counterfeiting. Love that you inked the doily black - never occurred to me, lol!